We hope everyone had a wonderful 4th of July yesterday! Our day was lots of fun-I crammed as much red, white & blue into our day as possible:) My sis in law, Christine, is here visiting and it has been da' bomb having her here with us. 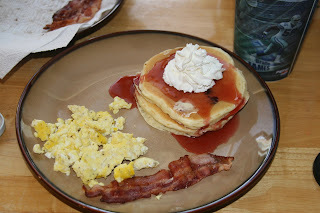 To start our day, we had our traditional blueberry pancake breakfast, topped with whip cream and strawberry syrup with sides of scrambled eggs and bacon. YUM. Then Cris, the girls, and I went and watched the "Kit Kittredge: An American Girl" movie. I don't think Joey minded staying home for that one:) It was a really sweet movie with a lot of great messages. Both of my girls liked it a lot. I really thought it was a cute movie and would recommend it for girls 4 and up. There is more drama than humor, but its good drama, nothing too much for kids. I think it got my girls thinking about how lucky we are to have what we have and how important it is not to judge others. I give it two thumbs up! Okay, I'll stop my movie review now:) And no, I don't plan on buying my girls these freakishly expensive dolls anytime soon. 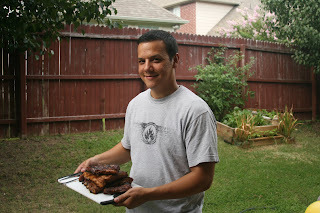 For dinner, Joey cooked us up some delicious Chamorro style ribs, rice, fresh picked green beans from our family garden, Hawaiian bread, hot dogs and corn. 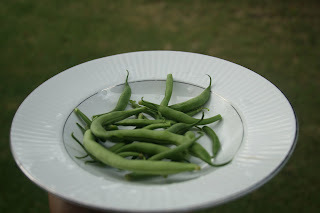 It was all delicious-thanks Joey! 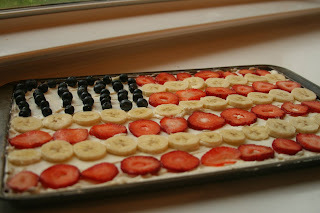 The girls and I made a fruit pizza in the shape of a flag. The finished product-Ella helped with the blueberry placement. 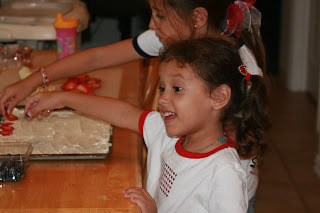 Aubrey helped with the strawberries and bananas. It looked lovely. In the evening, we went to our town's Red White & Boom and we were not disappointed. It was an awesome show! We met up with some friends and the girls ran, danced and played the night away. First we watched Josh Gracin(former American Idol contestant and now a country recording artist) perform. Then there was the fireworks show- put to some fun and patriotic music. The fireworks were gorgeous and we were up close enough to get a good view, but not too close to where the sound was too loud. Cali loved it and wasn't scared at all. She was smiling so big and clapping! Cali loved carrying around this flag. It was the cutest thing ever. Isn't this a cool picture? Me and blog buddies, Jess & Sheri. Both of these girls are pretty new to blogging-you should go check out their blogs and make a comment to say hello! :) They are both super fly chicks. And dang, I look so short in this picture. Either that or they are just really tall. Yeah, maybe thats it. .
We got home late with 3 tuckered out kids and 3 tuckered out adults. But did that stop us from more? No way! 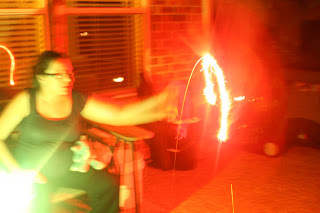 Joey, Cris, Aubrey and I lit a couple of sparklers. 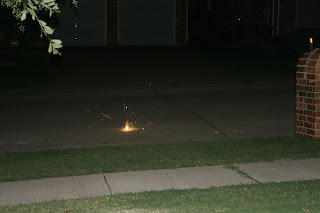 And Joey(of course-hes our pyro maniac:) did a little something illegal in the street. Wha ha ha ha. The flower-this is nothing compared to what he did when we lived in Buda(south of Austin). He basically did his own fireworks show in our backyard. Like mega fireworks. Like we coulda payed people to watch. Being the paranoid mom I am, little Aubrey, baby Ella, and I watched from an upstairs window and clapped. Good times. It was a wonderful Independence Day. I love this holiday so much because it is so important. Our freedom is one of our greatest blessings. We live in the most blessed nation on this Earth. I am so grateful to be an American and to live on this promised land. I am grateful for all those past and present who have fought and continue to fight to uphold those freedoms. Where would we be without our military? Hope everyone is having a great 4th of July weekend! What a fun 4th! Your girls look great in their patriotic attire!! I wish we could have been there. It looked like a fun filled day. 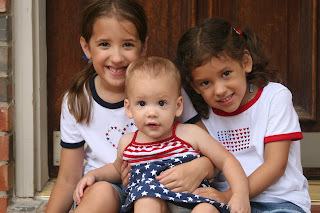 The girls were cute in their Red, White, and Blue. Tell Cris hi for me. Do you think the boys would like the movie? Looks like a fun 4th! Those are some great pictures! I love the picture of Cali with the fireworks in the background. What a fun day. Ours was jammed packed with fun too but I don't have time to post it yet. I love the picture of Cali waving the flag....all three of your girls are so cute. Tell Christine hi from me. I'm hope this trip has cheered her up. I looked up Jess and Sheri like you asked us to. I was able to leave a comment on Sheri's blog but I couldn't on Jess's....there was no place for comments...I tried. Yesterday was awesome. I had so much fun. It was an action packed day. 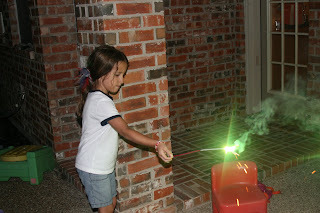 Topping it off with sparklers was fun. I wish I could have blown something up too. Sigh. Oh that looks like you all had so much fun together!! Thanks so much for sharing all these lovely pictures and goodness with us! i had linked jess wrong-oops! i fixed it now. We had a fun 4th in Grapevine -- thought of you but I know you live a long ways from where we were. Sounds like a lovely day for you guys. Okay, I forgot to change your new address in my google reader, I was starting to wonder where you went! Don't worry, it's fixed now. I totally forgot about the Red, white, and boom thing. :( Well, I'm glad you guys had fun! See you soon! what a wonderful day it looks like you had!!! i am sitting here wallowing in my misery as ours SUCKED!! i'll be blogging about it tomorrow but hope it's okay if i swipe a few of your sweet photos to show what i wanted to be doing instead of spending the day in the hospital getting blood!! (long story.) your family is so beautiful, holly!! Happy 4th holly, looks like a great time! I should have joined you at the fireworks, I didn't want to go by ourselves!! P.S. That picture with Cali and the fireworks is really neat. How did you do that? Just to let everyone know. 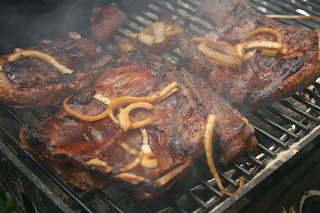 Joey makes the best ribs!!! Hey, I would like that blueberry pancake recipe!